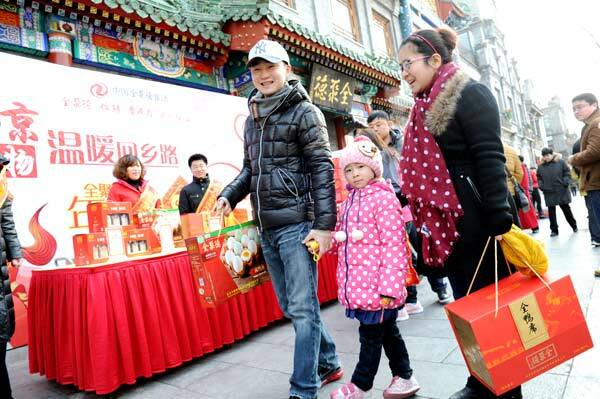 Some well-established Beijing brand-name eateries are offering their typical foods as nianhuo,or Spring Festival goods packages. Quanjude Group?ˉs restaurants, not only Quanjude Peking Roast Duck Restaurant, but alsoFangshan, Fengzeyuan and Sichuan Fandian restaurants, have put their duck, meat and staplefoods in packages so people can buy them to eat at home after simple reheating. The gift hampers are available not only in supermarkets, but also at Spring Festival goods tentsand stands in front of the restaurants. Some of these are at Quanjude?ˉs Hepingmen branch,Wangfujing branch, and Fengzeyuan?ˉs Zhushikou Xidajie (west street) branch. Quanjude offers a gift box of Peking roast duck, complete with pancakes and brown sauce.There are also hampers with salty preserved duck eggs, with assorted duck jerky, giblets, duckfeet and wings. The deluxe version has everything mentioned above, as well as spicy chicken hearts, chickenneck, marinated feet and wings. Fengzeyuan has introduced a flour staples box, a meat dishes box and a mixture of flour bunsand meat. Roast steamed bread and ?°silver thread?± steamed buns are traditional Beijing foods. Quanjude?ˉs single product boxes range in price from 128 yuan to 258 yuan ($21-$43). This year the restaurants have also made the goods available on the Internet, on popular portalsincluding Taobao, Jingdong and the No 1 Store.